It is very rewarding for any parent to see their kids growing and developing happy and healthy. Good nutrition is vital for the healthy growth and happiness of your child. Making sure your child eat properly is not just a matter of serving any kind of food. When you feed your child properly, you are giving his (her) body and mind not only what they need for today but also the raw materials for her healthy growth and development throughout his (her) childhood. That’s why as a mother, I’ve decided to make a series of 7 days 7 fun easy healthy meals for toddlers. Hope you find it helpful! 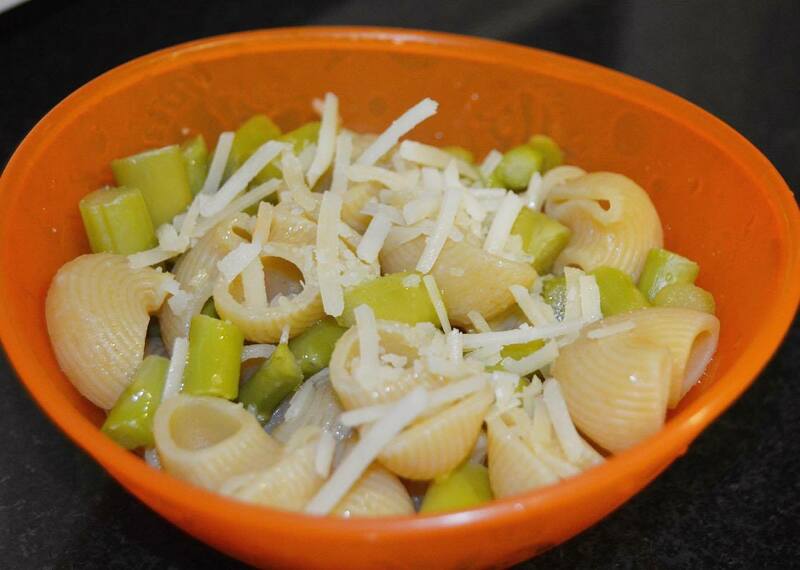 Today I am going to start with a very simple dish “the Pipe Rigate with Asparagus”. Asparagus is an excellent source of vitamin K, folate, copper, selenium, vitamin B2, vitamin C, and vitamin E. It is a very good source of dietary fiber, manganese, phosphorus, niacin, potassium, choline, vitamin A, zinc, iron, protein, vitamin B6, and pantothenic acid. Tip of the day: parents are not always aware of whether their child is overweight. That’s why it is better to measure his (her) Body Mass Index (BMI) while taking him (her) in for his (her) physical check-up starting from age two. Kids who measure at the 85th to 94th percentiles are considered overweight, because of excess body fat or high lean body mass. A child whose BMI is between the 5th percentile to 85th percentile is in the healthy weight range. A child with a BMI below the 5th percentile is considered underweight. 1. Add an inch or two of water to a small saucepan with a lid, and then insert a steamer basket. The surface of the water should be under the basket. Bring the water to a boil over high heat. When you hear the water bubbling and see steam starting to emerge from the pot, it's ready. Scatter the vegetables over the steamer basket. Cover the pot and reduce the heat to medium. Steam the asparagus for 15 minutes until tender. 2. Cook the pasta in a large saucepan of boiling water until al dente, about 9 minutes, then drains. 3. Mix the asparagus and the pasta in a bowl then season with olive oil and Parmesan cheese.